You can’t avoid thinking about erosion while standing on one of Oregon’s rocky headlands. The waves keep coming, one after another, each crashing repeatedly against the same rock. Impossibly, the rock appears unmoved and unchanged. How can it not erode? 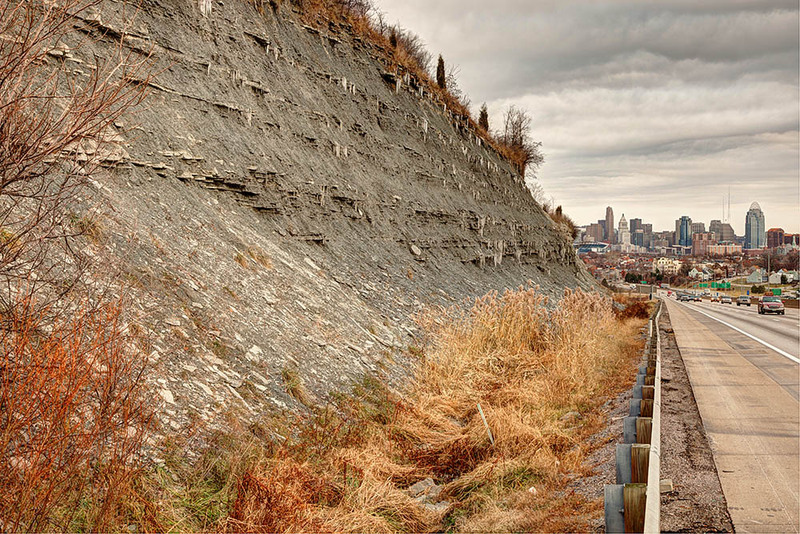 The answer, of course, is that headlands do erode, quickly, but on a geologic time scale. We just miss out because we live on the much shorter human time scale. And the erosion belongs to a cycle in which coastal uplift causes eroded and flattened headlands to rise and become headlands once again, all subject to more ongoing erosion and uplift. Wave energy is most intense at headlands because the incoming wave typically feels the ocean bottom near the headland first, which causes the wave to refract. As shown in the aerial photo below, this refraction focuses the wave energy on the headland. Wave refraction causes wave energy to focus on the headland. Arrows are perpendicular to wave fronts. As you can see in the next few images, headlands don’t erode evenly. They erode irregularly, as the waves exploit any kind of weakness in the rocks such as faults and fractures, or if they’re sedimentary, bedding surfaces. The products of this erosion are as beautiful as they are interesting: sea stacks, sea arches, sea caves… The list goes on and on. Aerial view of Heceta Head, Oregon. From the above photo, you can see that sea stacks are simply the leftover remains of a headland as it retreats from erosion. 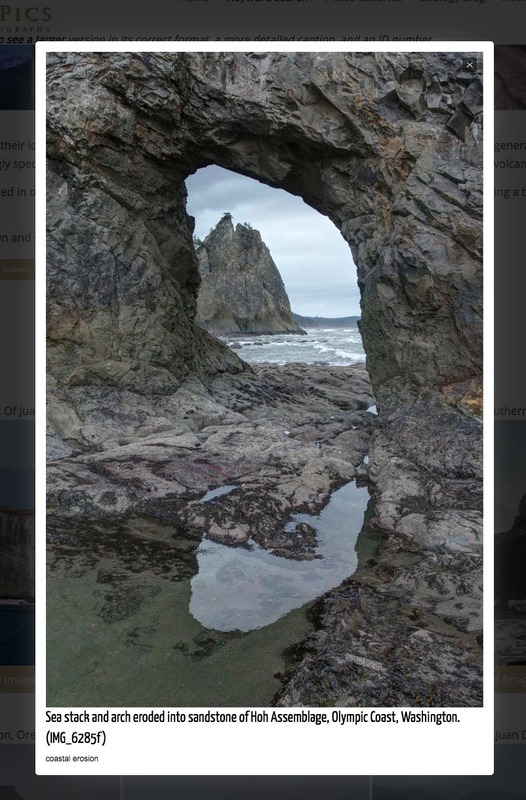 That’s a critical point, because some sea stacks, especially the one with the arch in the photo below, are a long way from today’s coastline. Those rocks, 1/4 to a 1/2 mile away used to be a part of the coastline? The land used to be way out there? YES!!! For me, that’s one of the very coolest things about sea stacks –they so demonstrate the constant change taking place through erosion. Taken to its extreme, erosion renders headlands into wave-cut platforms, such as the one below at Sunset Bay. Being in the intertidal zone, these platforms make great places for tide-pooling–and ironically, for people-watching too. Geologically, they form important markers because they’re both flat and form at sea level. When found at higher elevations, they indicate uplift. In fact, looking carefully at the photo above, you can see a flat surface on the other side of the bay. It’s an uplifted wave-cut platform! Called a marine terrace, it’s covered by gravel and sand originally deposited in the intertidal zone. Those deposits rest on bedrock that, at an earlier time, was also flattened by the waves. The photo below shows a better view of this terrace from the other side. Breaking wave at Shore Acres State Park, Oregon. Tree-covered flat surface in the background is an uplifted marine terrace. These uplifted marine terraces can be found up and down Oregon’s coastline. Researchers recognize several different levels, the oldest being those uplifted to highest elevations. The one in the photo above at Shore Acres State Park is called the Whiskey Run Terrace and formed about 80,000 years ago. You can see a similar-aged terrace below as the flat surface beneath the lighthouse at Cape Blanco, Oregon’s westernmost point. An older, higher terrace forms the grass-covered flat area on the right side of the photo. Cape Blanco, Oregon looking NE. The flat surface beneath the lighthouse is the ~80,000 year-old Cape Blanco Terrace, probably equivalent to the Whiskey Run Terrace at Shore Acres; the flat area on the right side of the photo is the higher Pioneer Terrace, formed ~105,000 years ago. Researchers take the approximate ages of the terraces and their elevations to calculate approximate rates of uplift. 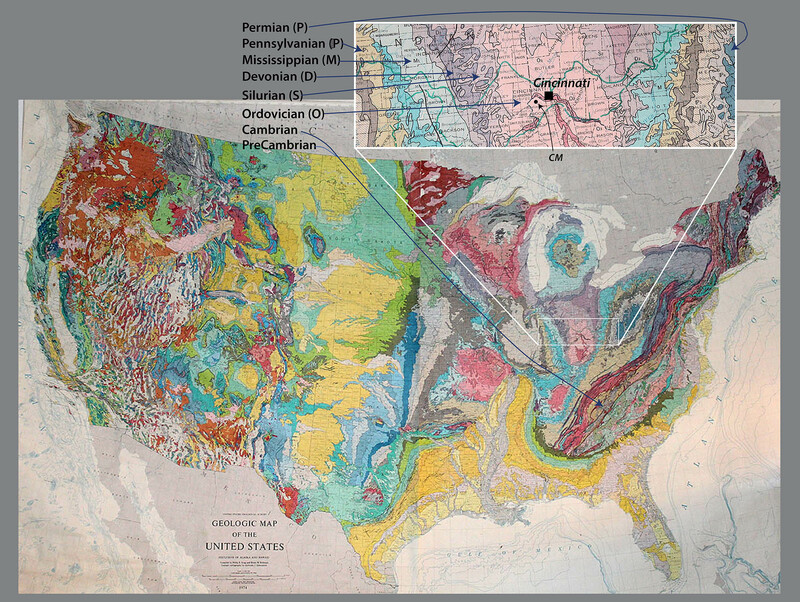 In this area, Kelsey (1990) estimated a rate of between 4-12 inches of uplift every 1000 years. That might seem slow, but over hundreds of thousands of years, it can accomplish a great deal. And look! The uplifted terraces? They’re on headlands! Of course, because they’ve been uplifted! And the headlands are now eroding into sea stacks and then platforms –to be uplifted in the future and preserved as marine terraces that sit on top headlands. And on and on, as long as the coastline continues rising. Blowhole near Yachats, Oregon. Incoming wave funnels up a channel eroded along a fracture and explodes upwards on reaching the end. Kelsey, H.M., 1990, Late Quaternary deformation of marine terraces of the Cascadia Subduction Zone near Cape Blanco, Oregon: Tectonics, v. 9, p. 983-1014. (Detailed study of Cape Blanco, including uplift rates). Miller, M., 2014, Roadside Geology of Oregon, Mountain Press, Missoula, 386p. (General reference which details the concepts and includes several of the photos used here). 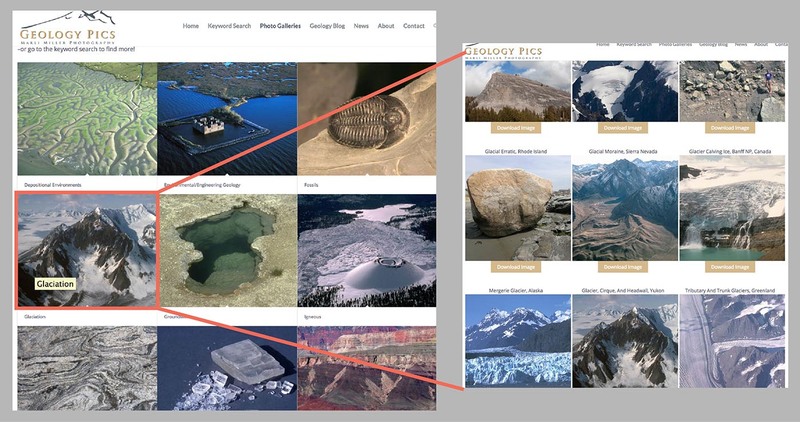 Earth Science Photographs–free downloads for Instructors or anybody: my webpage! What a start to the new year! 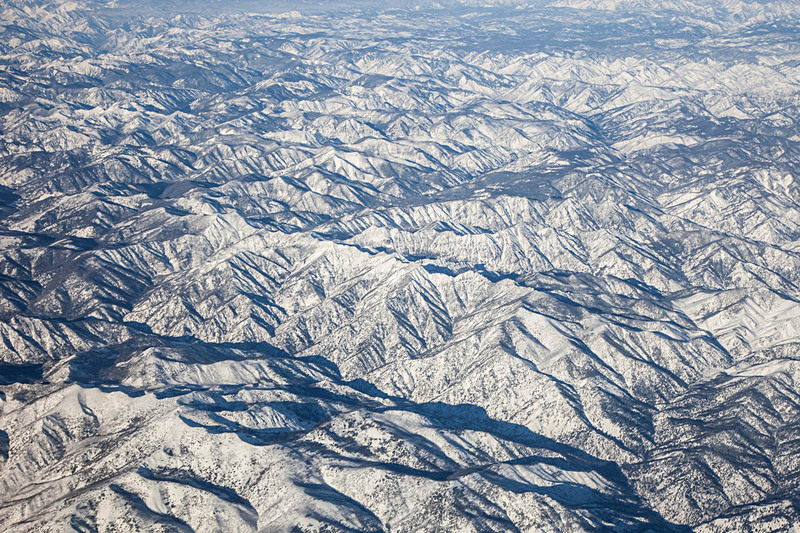 January 1, I flew home to Oregon with a north-facing window seat on a spectacularly clear day. So much incredible landscape! So much incredible geology! 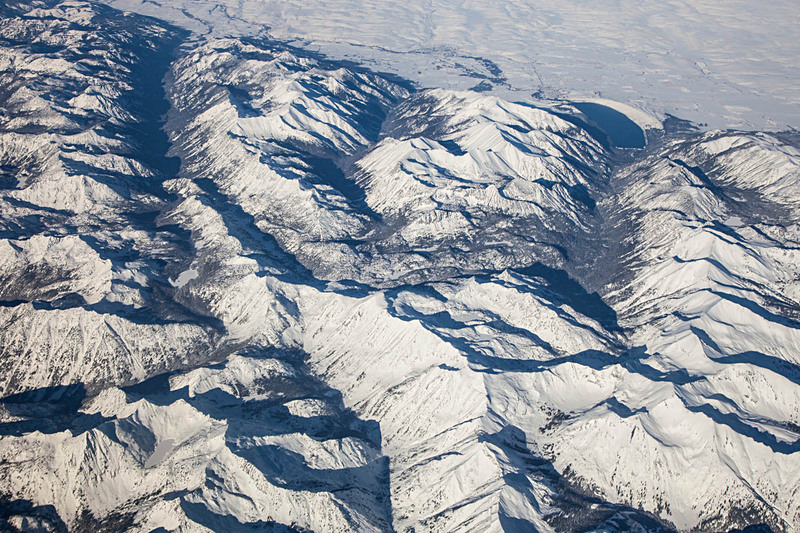 Here are nine photos I shot out the plane window, keyed to the geologic map below. Photo 1. 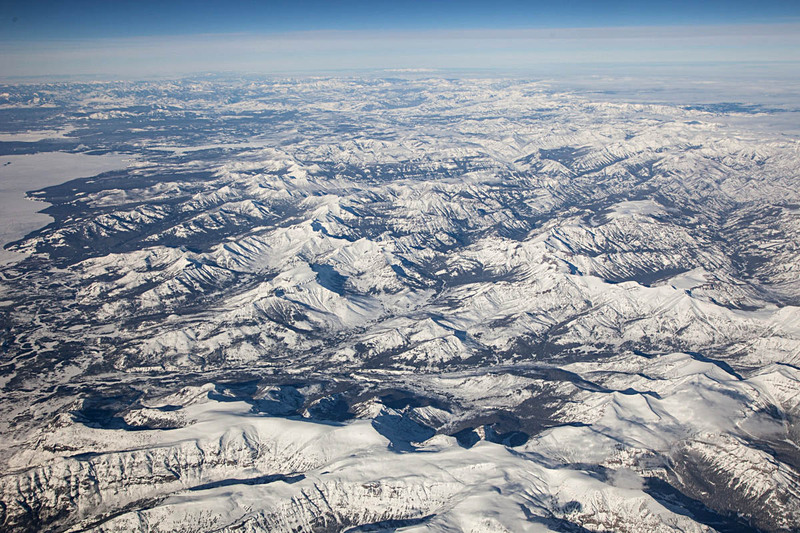 Absaroka Range, northern Wyoming and southern Montana. You can see that these mountains consist of layered rocks (see bottom of photo especially)–but they’re not sedimentary. They are basaltic to dacitic lava flows and pyroclastic rocks of the Absaroka Volcanic Field, erupted from about 53-43 million years ago. Much of the present topography is the result of glacial erosion during the Pleistocene. Absaroka Range, east edge of Yellowstone Lake on left. Photo 2. Yellowstone Lake. As you can see on the map, Yellowstone Lake fills only a fraction of the caldera created by Yellowstone’s Lava Creek Eruption, 600,000 years ago. Since then, rhyolite lavas, shown in pink, filled in the caldera. Notice the oval-shaped bay at the end of the lake’s western arm. It’s called West Thumb, and is a younger caldera that erupted about 150,000 years ago. It’s a caldera within a caldera! It’s pretty big too– almost identical in size to Crater Lake in Oregon –but compared to the main caldera, it’s tiny. 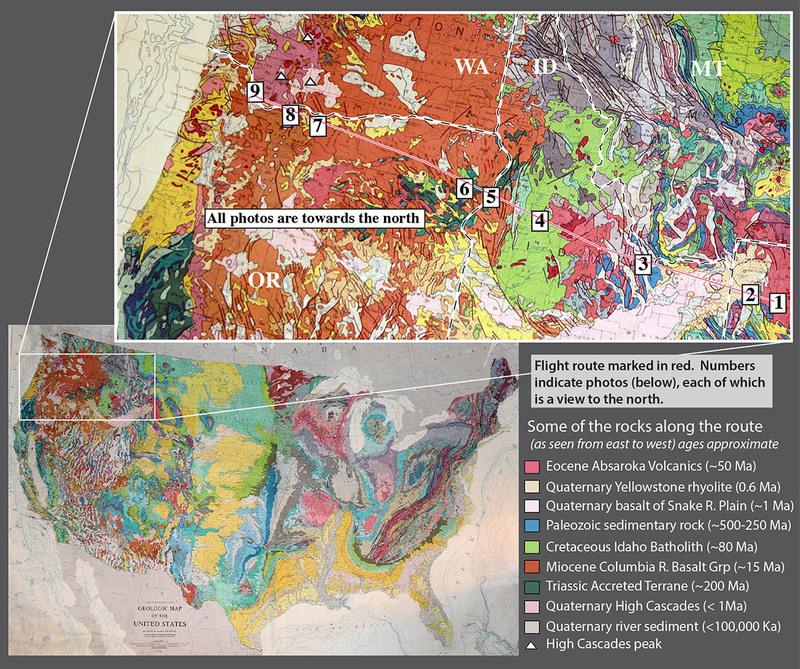 Photo and geologic map of Yellowstone National Park. The dashed red line marks the caldera edge. Photo 3. Recent faulting of the Basin and Range Province. In this photo, the Pahsimeroi River flows northwestward to its confluence with the Salmon River, near the left side of the photo –and the Salmon continues flowing northward for about 100 miles before it turns westward and eventually joins the Snake River. 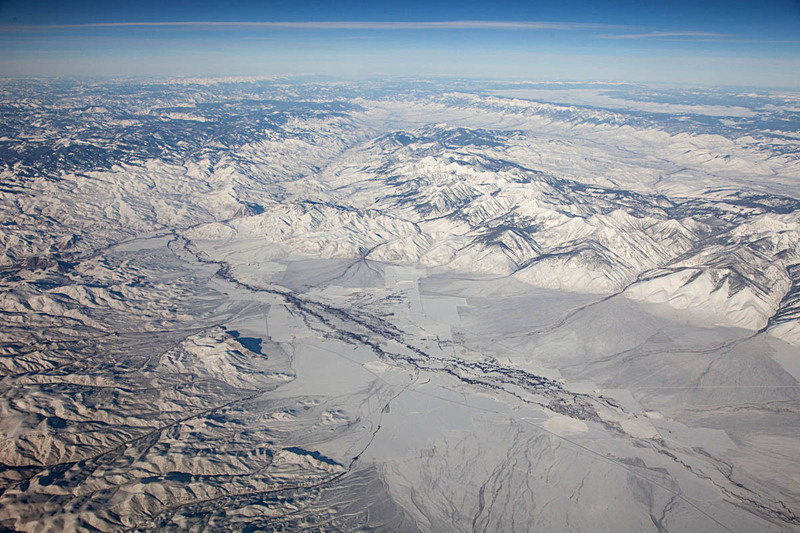 Recent faulting along eastern edge of Pahsimeroi Valley, Idaho–and western front of Lemhi Range. But what I think is so cool about this photo is that it so clearly shows the abrupt western edge of the Lemhi Range, which runs diagonally from the right (east) side of the photo to just above the center. The range literally rises right out of the ground. That abruptness is caused by faulting that takes place recently and frequently enough that erosion doesn’t keep up with it. The fault is a normal fault, caused by crustal extension. Notice the linear nature of the ranges to the northeast (upper right) –More normal faulting! This is a northern expression of the Basin and Range Province. Woohoo! Photo 4. Mountains of the Idaho Batholith. Granitic rock of the Idaho Batholith underlies a huge area of Idaho, some 14,000 square miles of it. On the geologic map, it’s the big green area. The rock intruded as a series of plutons during the Late Cretaceous, from about 100 – 65 million years ago. Similar in age and composition to the Sierra Nevada Batholith, the Idaho Batholith was fed by magma created during subduction along the west coast of North America. Photo 5. Hell’s Canyon. Not only does the north-flowing Snake River in Hell’s Canyon form the boundary between Idaho and Oregon (Yay, we made it to Oregon! ), and not only is it the deepest canyon in the conterminous United States, but it’s also incredibly important from a geologic-history-of-western-North-America point-of-view. Notice the flat areas above the canyon–they’re especially visible on the west (left) side, but you can also see them on the east. Those places are flat because they’re made of flat-lying basalt of the Columbia River Basalt Group. 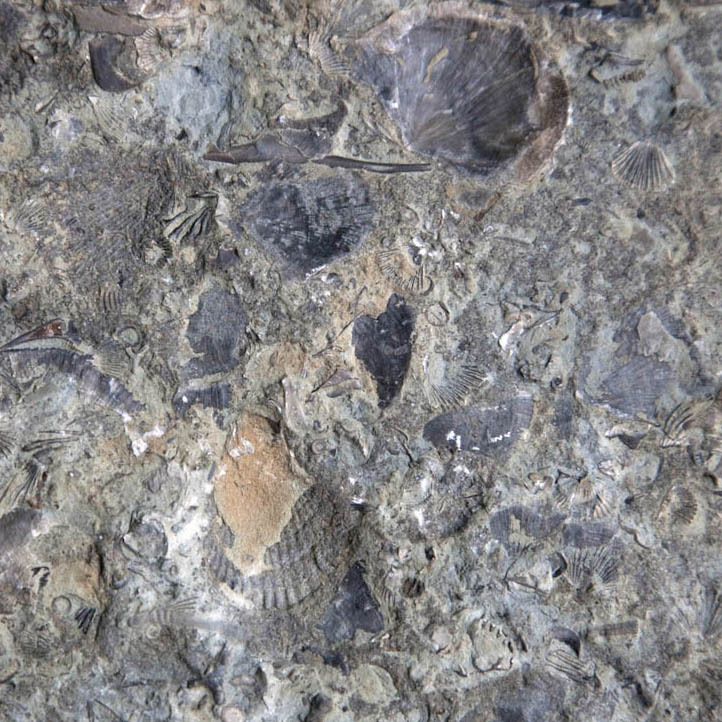 These basalts erupted mostly between 17-14.5 million years ago, but kept erupting off and on until about 6 million years ago –and they cover ALL of northern Oregon and ALL of southeastern Washington State. In fact, they flowed all the way to the Pacific Ocean. Hell’s Canyon and the Snake River. The Imnaha River forms the next deep canyon to the left (west). Those basalt flows overlie rock of the Wallowa accreted terrane: mostly volcanic and sedimentary rock that formed in an island arc setting, far offshore from North America. 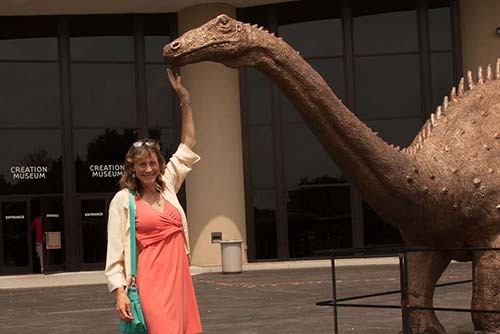 It was added (accreted) to the North American continent during the Mesozoic –probably some 150 million years ago. Photo 6. Wallowa Mountains, Oregon. 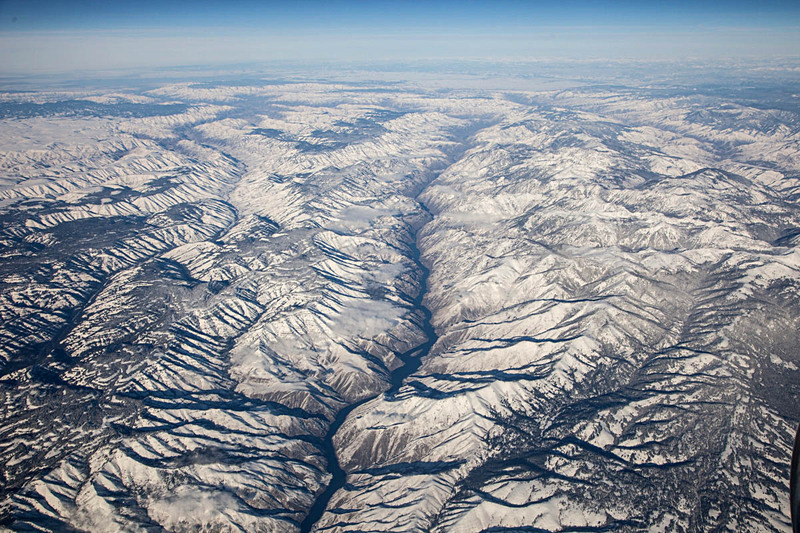 Just west of Hell’s Canyon are the Wallowa Mountains, Oregon’s premier alpine country outside of the Cascades. 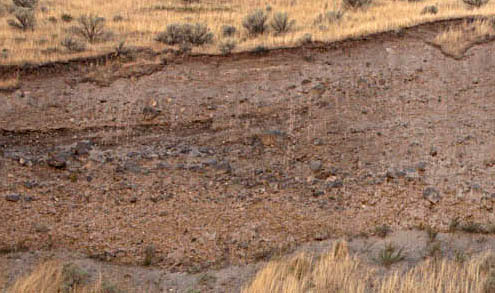 Like Hell’s Canyon, the Wallowas contain the accreted Wallowa terrane overlain by Columbia River Basalt –but the Wallowas also host the Wallowa Batholith, a Jurassic-Cretaceous granitic “stitching pluton”. It’s called a stitching pluton because it intrudes across accreted terranes and “stitched” them together. Glacial valleys and frontal fault zone on the north side of the Wallowa Mountains, Oregon. You can see a bunch of other things in this photo though. First off, the mountains end suddenly in a line: a recently active fault zone that has uplifted them more than 5000′ relative to the valley floor. Also, you can see how glaciers carved the landscape. Notice the deep U-shaped valleys, cirques, and knife-edged ridges called aretes. And see the lake in the upper right corner of the photo? It’s Wallowa Lake, dammed by a glacial moraine! Photo 7. View of Washington High Cascades over The Dalles. That’s Mt. St. Helens on the left (west), Mt. Adams in the middle, and Mt. Rainier in the far distant right. Mt. Rainier is 90 miles away! Looking north over the Dalles to Mts. St Helens, Rainier, and Adams. These volcanoes are dormant –which means that they’re …sleeping? And they can awaken at any time. I remember a college friend of mine wanted to climb Mt. St. Helens in 1979. It was dormant then, and nobody worried about it. Then in May, 1980 it erupted violently, blowing off its top 2000′. Both St. Helens and Mt. Rainier have erupted many times in the past several thousand years; Mt. Adams though, erupted only twice in that period. Photo 8. 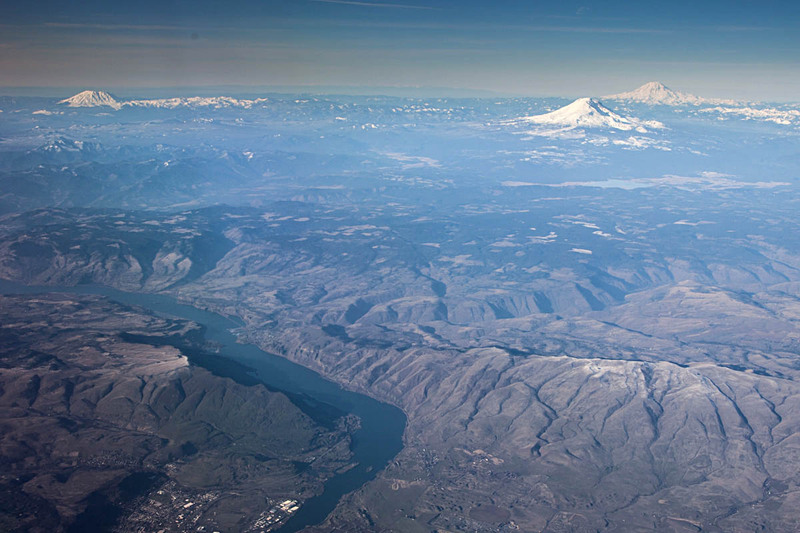 Columbia Gorge, the Washington High Cascades, and the Bonneville Landslide. From left (west) to right, the volcanoes are Mt. St. Helens, Mt. Rainier, and Mt. Adams. You can see the Bonneville Landslide along the river on the right side of the photo, directly below the left base of Mt. Adams. 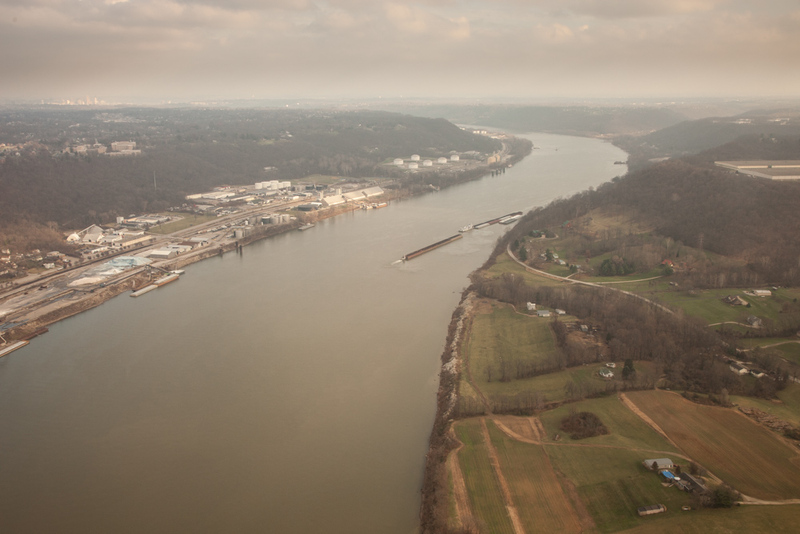 It detached from the cliffs directly behind it about 1450 A.D. and slid right into the river –and it pushed the river about a mile to the south! Just downriver from the landslide, you can seevthe Cascade Locks zig-zagging across the river. 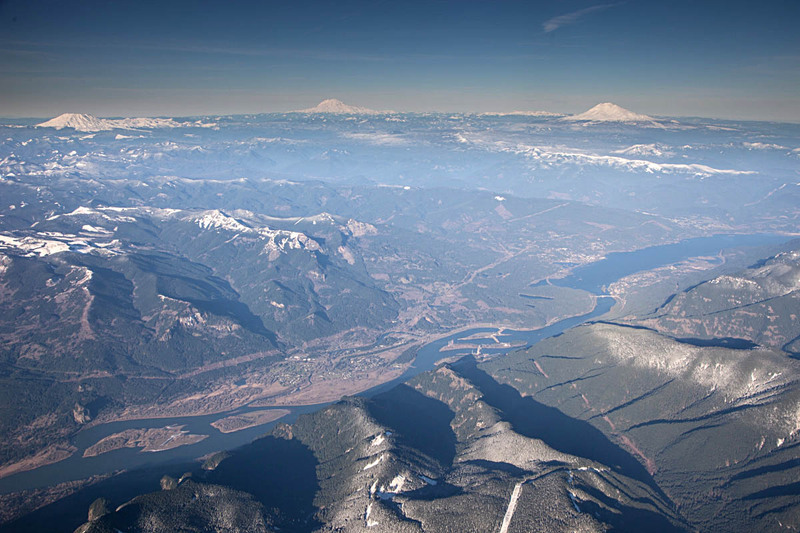 View northward over the Columbia River Gorge to the Washington High Cascades. The ridges at the bottom of the photo lead up to Mt. Hood, another dormant stratovolcano and Oregon’s highest peak. Apparently, the view out the south side of the plane was even more ridiculously cool. Photo 9. Columbia River, just below Portland. Right near Portland, the Columbia River turns northward for about 40 miles before it heads west again out towards the Pacific–and it drops only 10 feet in elevation for the whole distance. 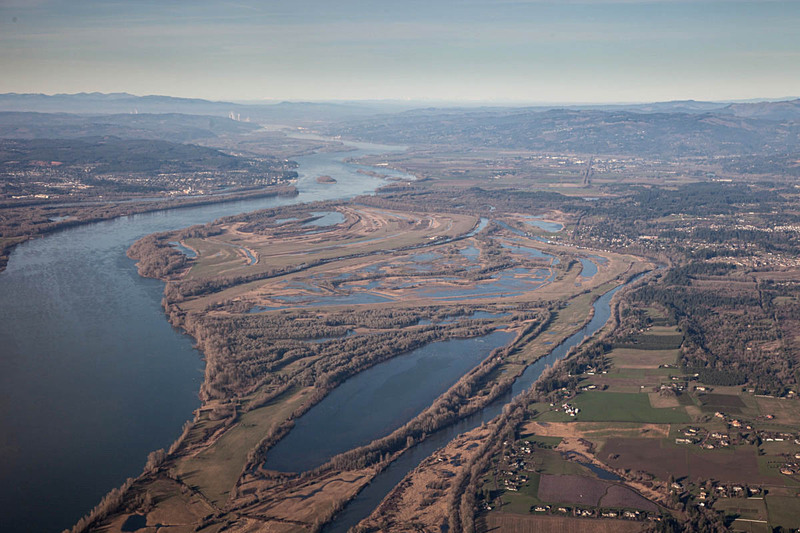 The northward deflection of the river is probably the result of uplift of the Portland Hills, which likely began as long as 16 million years ago (they also deflect 16 million year old lava flows of the Columbia River Basalt). That town along the river in the background is St. Helens, Oregon. View northward, down the Columbia River, Washington on the right, Oregon on the left. 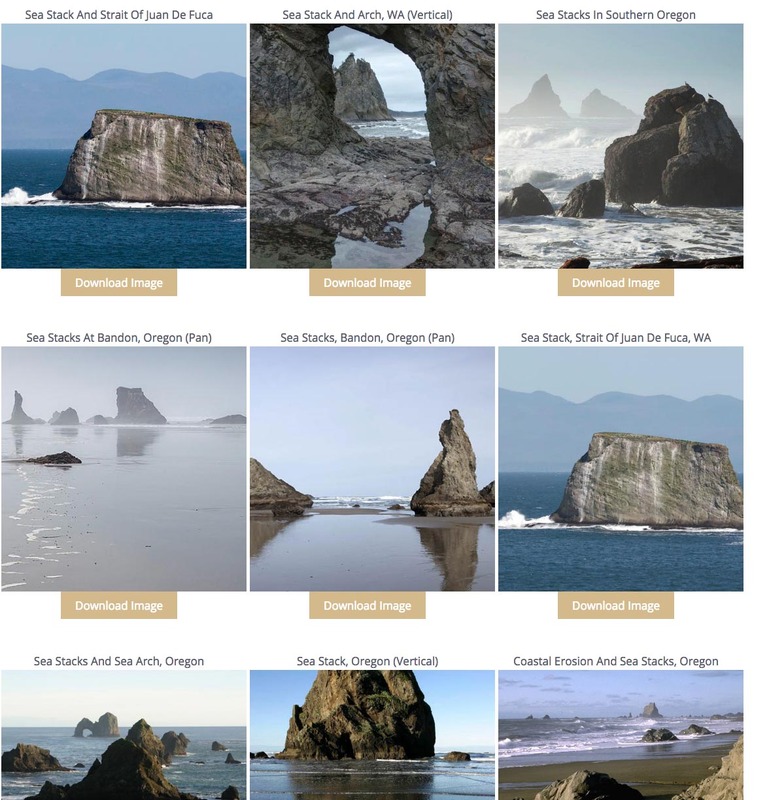 See more geologic photos of Oregon by typing “Oregon” into the geology search engine on my website –or type “Oregon, aerial” if you want to see aerial shots! And if you’re suddenly really excited about Oregon geology, please check out the new edition of Roadside Geology of Oregon! 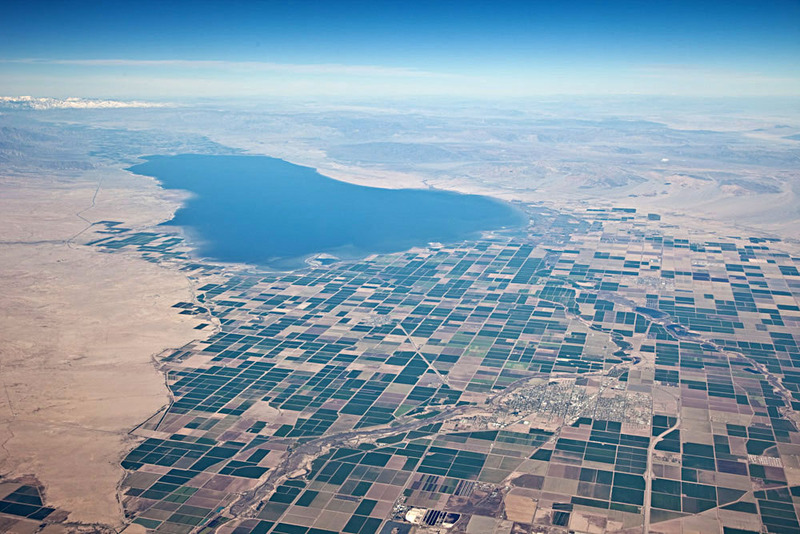 With a surface area of nearly 1000 square kilometers (381 square miles), the Salton Sea is California’s largest lake. But it’s relatively shallow –and because it has no outlet, it’s saltier than ocean water. It formed in 1905 when the nearby Colorado River overwhelmed irrigation canals and flooded the region. Now it’s an incredibly important migratory bird refuge, fishery, and dumping ground for agricultural waste. Seems like those things shouldn’t really go together! Aerial view of the Salton Sea, looking northward. But it just seems young. The Salton Sea actually occupies part of the Colorado River Delta –and as a result, has been filled with freshwater multiple times since the delta was first constructed, probably near the beginning of the Pleistocene. It’s also at the remarkably low elevation of 234 feet (71m) below sea level; the deepest part of the lake is 44 feet (13 m) below that. And the low spot is there because of extension caused by the San Andreas fault system! 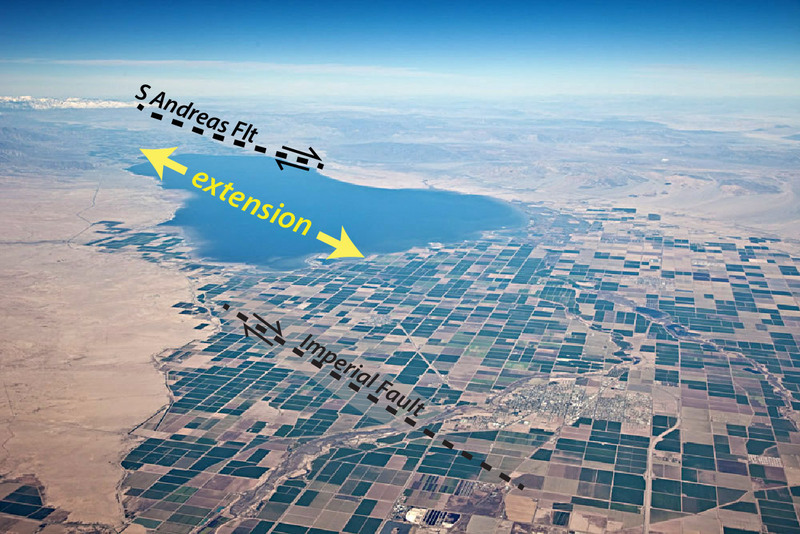 The San Andreas fault terminates along the eastern margin of the lake basin, but steps across the lake to the Imperial fault, which forms its western margin. Both faults are right-lateral –and because they step to the right, they pull the area apart in-between them. Kind of like central Death Valley –which is even lower in elevation than the Salton Sea! But more on Death Valley later. Aerial view of Salton Sea, with the approximate locations of the southern San Andreas and Imperial faults. Note how right-lateral slip on the two en-echelon faults drive extension between them. click here to see more photos of the San Andreas fault system, or click here to see a photo geology tour of Death Valley, California.